This is one of my favorite pictures. 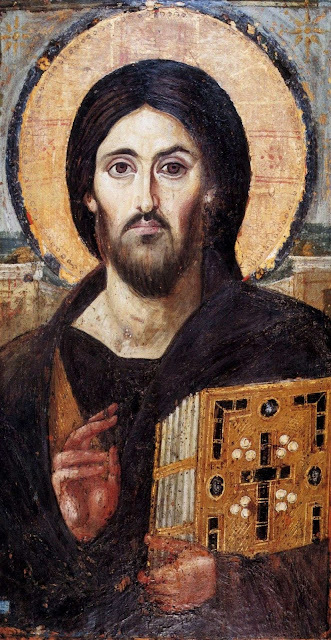 It's dated to the 6th century AD and is called Christ Pantocrator, which means Christ Almighty. Take a good look at the picture before you continue reading. What do you see? Maybe you've noticed some things about the picture. Look at it again, focusing on the right side of the face of Jesus. Let me help with the cropped image below. What do you see now? Now one more. Look again, focusing on the left side of his face. I'll help again with a cropped image. Describe what you see. Go back and forth between the two cropped images. Fascinating, isn't it? One side depicts Jesus full of grace and love, his hand raised in the sign of a blessing. The other side, however, shows us the righteous judge, holding the Word of God. On one side, the skin is almost porcelain. The other side, not so much. Not only that but notice the raised eyebrow, the sneer on the lip, the sharper, downward slope of the mustache. Hippie Jesus on one side and, dare I say it, Jafar Jesus on the other side. Same Jesus, but different perspectives. If you read much of the Bible, you probably have a favorite Gospel. Sure, you might like different things about each of them, but I bet you have a favorite. Maybe you like John's Gospel. Maybe not. Each Gospel writer takes a different approach. Each has a different focus, different stories, different beginnings, and even different details about the ending. Different perspectives. Some folks like to talk about how the Gospels contradict each other. I think that's overstating it. I'm happy about the differences. Frankly, if they all lined up perfectly all the time, then I'd be worried. Next time we'll take a closer look at the four Gospels, four perspectives on Jesus. This painting only tell us the perspective of jesus of the artist who painted it in the 6th century. Nothing more. A question though. Hi RKIA, thanks for reading. I couldn't agree more, this is simply a painting that depicts the artist's understanding of Jesus, and that's why I never suggested anything more than that in my post. As far as your question, I'm afraid I don't have a lot to say on the matter. There are all sorts of other folks already doing that sort of thing online, as you probably know. If you read through my other posts, I think you'll see I prefer to spend my time discussing biblical Hebrew, Aramaic, and Greek, and the nuances that are often oversimplified or lost in translation. Apologetics bores me. That's just a fact for me and who I am, not a shot at those who engage in those conversations. It bores me the same way chemistry bores me. Or golf. Or books by Mary Higgins Clark. I enjoyed Spanish more than chemistry in high school, I like nearly every sport more than golf (except for maybe NASCAR), and I never get tired of Ernest Hemingway. Those other things are great for some people, but, like apologetics, I tend to lose interest quickly in them. Sorry that's not much help to you, but again, thanks for reading. Thanks Kia. Hope you stick around and share. How many olives do you suppose Jesus ate between the ages of 14 and 26? Thanks for stopping by, Mrs. M.
@ Mrs. McMommu. Out of curiosity, which ''Jesus'' are you referring to? Yep. I've been sharing that with students for years. They always agree.